Towards the implementation of the Law on Communal Police as part of the bylaws preparation for its implementation, as well as the obligation of local governments to prepare a Plan of internal reorganization, which content will be significantly affected by the structure of communal police services, the Union of Municipalities, in cooperation with the Ministry of the Interior has organized a meeting of Chief police services on 18th February 2015. The meeting was organized by the initiative of Chiefs communal polices of Kotor, Bijelo Polje, Budva and Podgorica. Ms. Dragan Ranitovic, Director of Public Administration and Local Self-Government within the Ministry of the Interior, reminded the audience that the Law on Communal Police was adopted on 26th December 2014 and its implementation will start from 3rd October 2015. In this transitional period, the Ministry of the Interior and all local government units have task to create conditions for full and effective implementation of the Law through the adoption of bylaws and professional and organizational preparation of communal police services. Mr. Refik Bojadzic, Secretary General of the Union of Municipalities, stressed the importance of legal provisions for the quality of communal supervision and provision of communal order in the municipalities. He also gave a brief overview of the municipal obligations that should be implemented by the beginning of the Law implementation and related organizational activities as well as the training for communal police officers. He has emphasized the fact that the Law on Communal Police was adopted at the end of the last year, after the adoption of the municipal decisions on budget so the funding of the activities that are a prerequisite for the Law implementation is questionable. The further cooperation between the Ministry and the Union of Municipalities is necessary to overcome this problem, especially in the field of providing the general part of the municipal police officers trainings. Ms. Tanja Tripovic, Deputy Director of the Police Academy noted that the Police Academy is the only licensed institution in Montenegro for the traning provision for security services including the communal police. The general part of the communal police officers training is set forth in the Police Academy Training Program. However, to determine the specific part of the training for communal police officers relating to the jurisdiction of communal police, actions on the field and in emergency situations, it is necessary to adopt the Law on Communal Services, as well as to specify the content of training program in cooperation with local government units. She also pointed out that the Police Academy lecturers do not have the necessary knowledge to provide special part of the training for municipal police officers so in this case they should engage external lecturers. 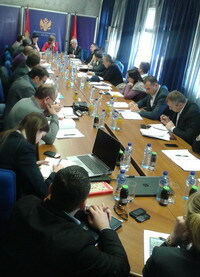 During the discussion, chiefs of communal polices have pointed out: sensitivity of legally established authority relating to the use of force and restrictions of basic human rights; dilemma regarding the division of competence between the communal police and communal and other municipal inspections; vocations of communal police officers who are not recognized by the Law on Civil Servants and Employees; the financial impact of the Law on municipal budget for the purposes of training, reorganization, equipment, tools, vehicles and premises, as well as other issues of importance for the efficient functioning of the municipal police services. Ms. Olivera Grbovic, representative of the Ministry of the Interior, pointed out that the Law intended to separate communal police and communal and other municipal inspections. In this regard, municipalities should determine whether the communal and other municipal inspections would be organizationally within the line secretariat or a special local government body would be established to perform the inspection, by their acts on organization of local administration bodies and services.